The catalog for Potter & Potter's upcoming auction of "Houdiniana" is now available for purchase at their website. The catalog will ship approximately three weeks prior to the sale on April 9, 2016. They've also posted a description of what to expect from this sale. Our April 9th auction is a two-part magic extravaganza. The first section will feature choice memorabilia related to the most famous magician and escape artist the world has ever known: Harry Houdini. 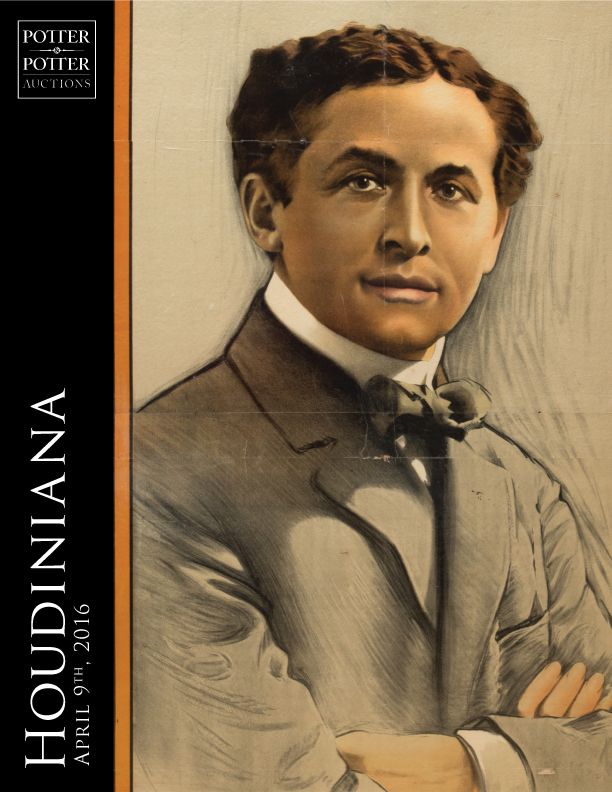 Lithographs, Broadsides and Challenges, featuring the iconic "Houdini for President" three-sheet poster printed by Strobridge Litho. Photographs and Ephemera, among them Houdini movie stills, postcards, manuscripts, autographs and correspondence, including unpublished material. Associated memorabilia, magic props, handcuffs, lobby displays, scrapbooks, and more - all related to Houdini, his competitors, and escape artists. The auction takes place at 10:00 am on Saturday, April 9th in our Chicago Gallery. Catalogs ship approximately three weeks prior to the sale. Previews take place in the gallery in the days preceding the auction, from 10am - 5pm, CST. If Potter & Potter follow their normal practice, a free downloadable version of this catalog will be made available online as well.